At the K 2013 (hall 10, booth A04), WITTMANN is presenting a complete production cell including a quality inspection module manufacturing IML packaging parts. 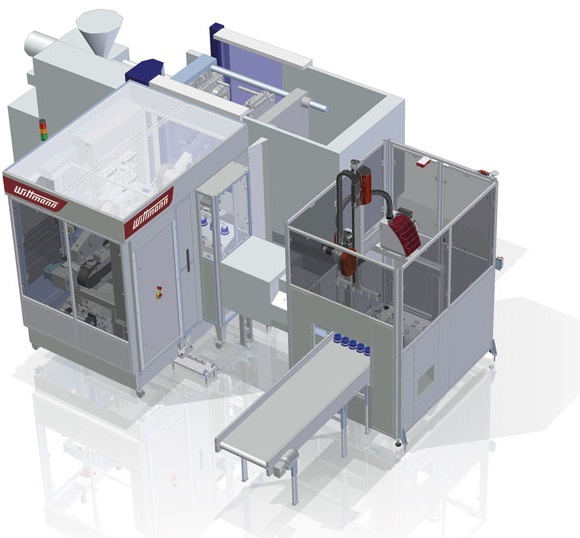 The 4-cavity line is based on a WITTMANN BATTENFELD TM Xpress 210 injection molding machine; the mold and the W837 automation equipment come from WITTMANN. On a TM Xpress 210 injection molding machine from WITTMANN BATTENFELD, 4 cups each holding 300 ml are decorated with banderole labels. The cycle time is about 4.5 sec, with the robot’s operation time amounting to less than 0.7 sec. This extremely short operation time for inserting the labels plus parts removal has been accomplished by using the WITTMANN “all-wheel” drive concept. In this process, both cog belt wheels of the horizontal axis are synchronized and driven by highly dynamic drive systems. This concept permits acceleration rates of up to 110 m/sec² with extremely low power consumption. The labels are presented to the robot by a tilted four-fold dispenser. The filling level of the individual dispenser compartments is monitored by a level switch. Whenever a stack of labels reaches the minimum level, a signal lamp lights up. In that case the operator can refill the labels without interrupting the automatic process. The insertion and removal gripper is mounted on the horizontal axis. 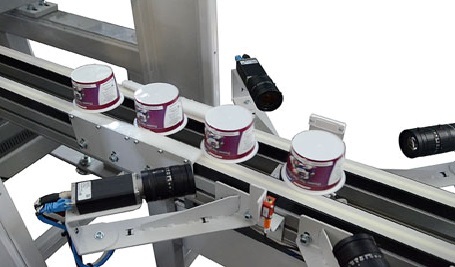 The rigid frame structure of the extension arm with a servo-driven insertion stroke ensures accurate label positioning in the cavity with simultaneous removal of the finished parts. The labels are taken over by dummy cores and precisely wrapped. The loading zones of the dummy cores are made of nonporous material to ensure that the dummy cores remain virtually free of wear and are easy to clean. Electrostatic charge is used to hold the labels in a fixed position inside the mold. The servo-driven stacking axis with integrated horizontal stroke and pivoting axis takes over the finished parts and deposits them on a conveyor belt.The equipment of this basic IML unit is rounded off by a mold height adjustment device to adjust the complete line, a protective housing complying with European safety standards and the WITTMANN CNC8.2 control system.The line on display at the K 2013 is a basic system extended by a quality inspection module and a stacking module. Due to constantly rising quality standards, the finished parts must be subjected to continuous quality inspection. Since manual quality inspection is no longer possible with high-speed manufacturing equipment, camera systems are more and more frequently in use. Several different concepts are used for this purpose. One of these concepts consists in checking the parts directly on the gripper systems. This is an appropriate solution for 1 or 2 cavities, but as soon as parts from more cavities must undergo thorough inspection, this method would no longer be practicable or economically feasible due to the large number of cameras required. Therefore this type of demand is met by the concept of a separate inspection station. Here, the parts are deposited on a transport track to pass through the inspection station one by one. In this way, only one station needs to be equipped with the necessary cameras. With standard image processing programs, however, this type of structure requires that the parts are presented to the cameras in precisely the same position every time, as measurement errors would otherwise occur. For rectangular containers, this presents no problem, since these are easy to guide on the transport track. But this is not possible with rotationally symmetrical parts, where “pseudo defects” repeatedly occur, since the inspection criteria are no longer recognized correctly if parts are turned to a wrong position. In order to solve this problem and thus meet the demand for parts inspection at the best possible rate of nearly hundred per cent, WITTMANN has realized for the first time worldwide a 3D high-speed inspection station for checking IML decorations. In this checking station, four high-resolution cameras are installed around the conveyor belt, which take pictures of every single product transported on the belt. Now it no longer matters in which rotational position a product passes the camera inspection station. The software evaluates the pictures taken by all four cameras and thus produces a 3D model of every part. The result of the parts inspection is now decided by this specific 3D model. Less sophisticated image processing methods cause shadows and blurring, which make it more difficult to read bar codes and data matrix symbols; small defects are not detected whenever they happen to lie below the “seams” between individual pictures. In the solution realized by WITTMANN, the software “breaks down” the 3D model created in each case and transmits the resulting image file to the extensive tool library of the image processing program for examination. The software is now able to check and compare all aspects of a product, starting from the ID codes right down to the label patterns, including colors – and accomplishes this for more than 500 parts per minute. All faultless parts continue on the conveyor belt to the stacking station. Here, the parts are stopped and compacted for optimal utilization of the buffer conveyor. The transfer device lifts the more tightly packed parts off the conveyor belt and stacks them on the buffer conveyor.Thanks to the use of standard axis modules from the WITTMANN linear robot kit, a great variety of special, customized versions can be created with an optimal price-performance ratio. 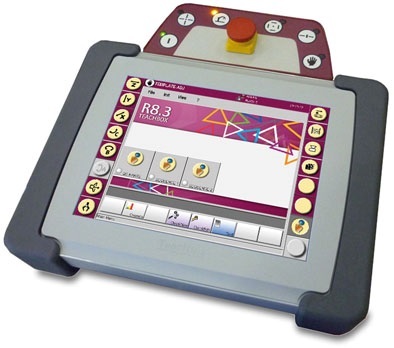 Control of the complete production cell is effected via the proven WITTMANN CNC8 control system. Consequently, all the benefits of the WITTMANN robot control system are at the user’s disposal. Adjustment and/or teaching of the programs can be carried out via the touch screen in 18 languages, which can be selected online. EcoMode, SmartRemoval, definition of safety areas and many other useful functions are also available for this field of application. Thanks to the numerous interfaces in the control system, users can receive optimal guidance and support. For example, mirroring of the TeachBox in the Intranet or Internet is possible via VNC. Moreover, the option of using an email function and the R8 CLI interface to integrate the production cell into an ERP system is also available.